What kind of notifications are there? Yandex.Mail. You received a new email. VK. You received a new message, comment, or friend request. You can choose to allow or block these messages, as well as customize their contents. Websites can send notifications about news, comments, updates, and other events. Usually, websites request permission to send notifications, but sometimes they can do this without permission. 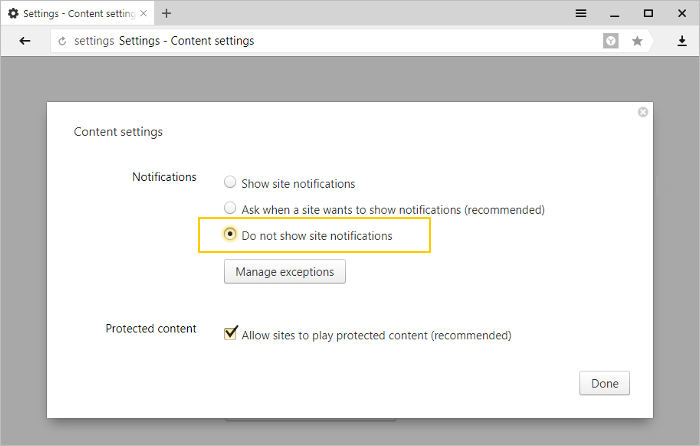 You can allow or block Yandex Browser notifications from a particular site, or you can block notifications from all sites. 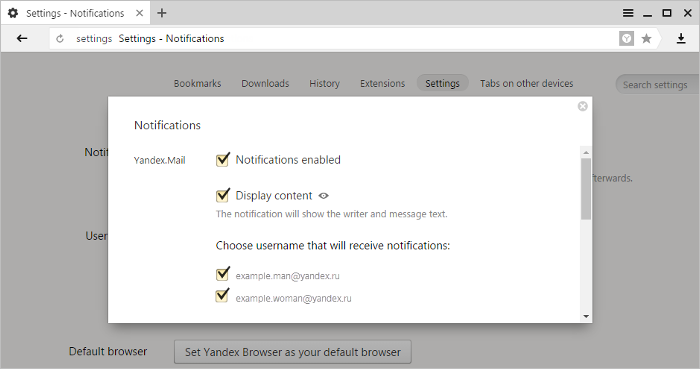 Yandex Browser will suggest that you enable notifications when you open VK or Yandex.Mail for the first time. If you decline, you can enable notifications later in the settings menu. In the Notifications section, click Notification settings. Go to the Yandex.Mail section. Turn the Notifications enabled option on or off. Go to the VKontakte section. Note. You can also disable notifications by clicking Disable. 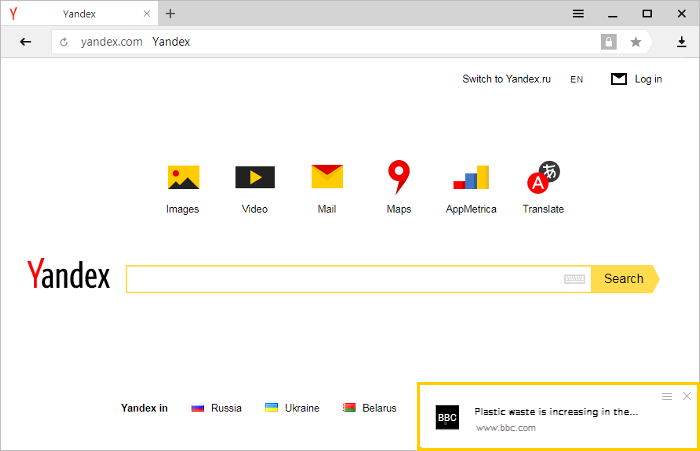 In this case, Yandex Browser will delete the social network authentication data that it saved. To display notifications again, you will need to re-check the Notifications enabled option and log in again. In the Notifications section, click Disable all notifications for three hours. To go to the site that the notification came from (VK or Yandex.Mail), just click on the notification. To hide the author and text of the notification so that only the subject is visible, click . To configure notifications, click . Check the options you want in the Yandex.Mail section. Notifications enabled Displays or hides notifications. Display content Displays or hides the message sender and text in notifications. If you don't want someone to see the content of incoming messages on your screen, clear this option. That way notifications will only display the message subject. Choose usernames that will receive notifications Displays notifications separately for each Yandex username. 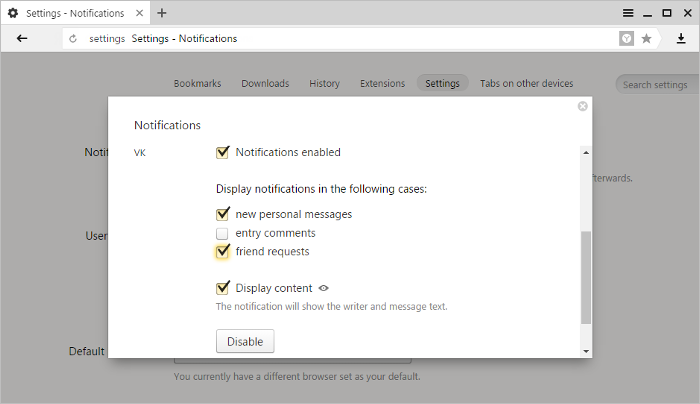 Display notifications in the following cases Allows you to select the events you want to be notified of (for example, if you only want to be informed of personal messages and friend requests). Display content Displays or hides the message sender and text in notifications. If you don't want someone to see the content of incoming messages on your screen, clear this option. After this, notifications will only show the message subject. 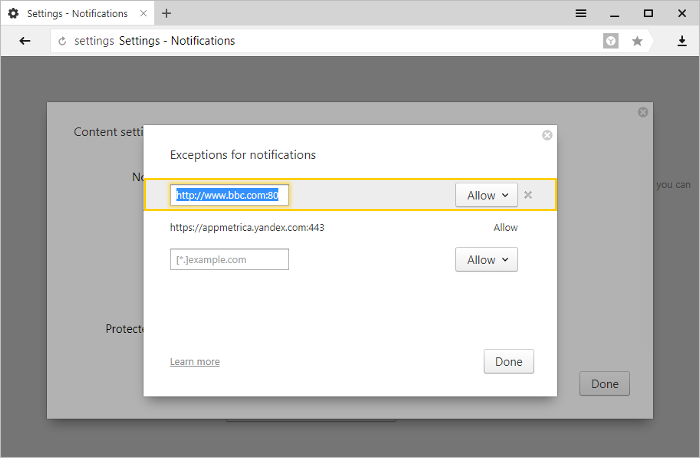 The first time you open a site that sends notifications to users, Yandex Browser will ask whether you want to accept or block notifications from that site. 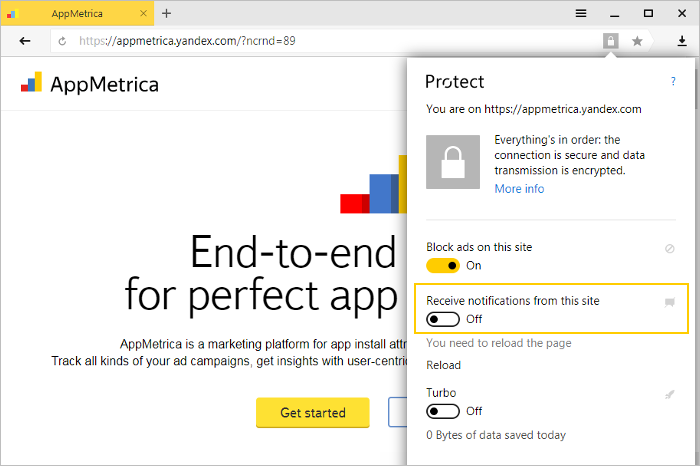 After you allow or block notifications, the Receive notifications from this site option will appear in the Protect panel, and the icon will appear in the SmartBox. Click in the notification. Open the Yandex Browser settings. Click on the website address. Select Block from the drop-down list. 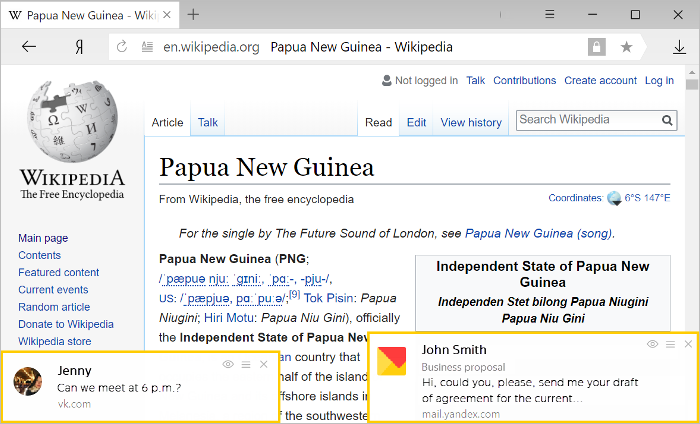 In the window that opens, turn the Receive notifications from this site option on or off. Select the required drop-down list item: Block or Allow. In the Notifications section, check the Do not show site notifications option.